Zenebech Abdu, from Kalu District, Ethiopia has benefitted from the Agriculture to Nutrition project (photo credit: ILRI\Apollo Habtamu). The International Livestock Research Institute (ILRI)-led African Chicken Genetic Gains (ACGG) project partners with the Agriculture to Nutrition (ATONU) project in implementing interventions to improve nutrition in smallholder farming families in Ethiopia and Tanzania. 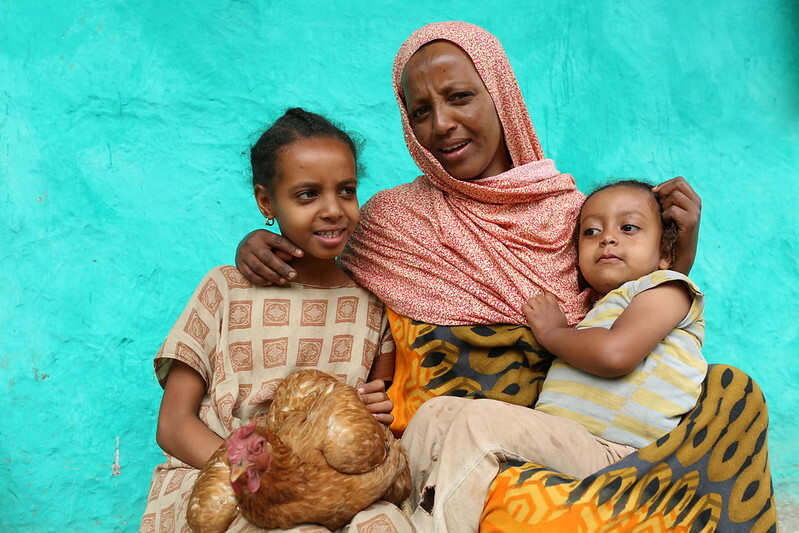 Zenebech Abdu’s family is among the targeted 800 households in Ethiopia. A smallholder farmer from Kalu District of Amhara Region, Zenebech is married and a mother of five children. She was among the farmers selected by the ACGG project to join the ATONU initiative in Arabo 21 Village. She received 25 chickens and started attending weekly behavior change communication sessions led by ATONU that focused on promoting the consumption of diversified meals to improve household nutrition in the village. The weekly sessions were attended by 76 (39 women) people. They covered nutrition; water, sanitation and hygiene practices; women empowerment; chicken management, vegetable production, and consumption. Participants also learned new ways of preparing different foods during cookery demonstration sessions led by nutritionists who worked with households in the project area. ‘My neighbours and I learned the easiest and most cost-effective way of preparing Doro Wot (Ethiopian traditional chicken sauce) using new techniques and methods to ensure it is of high nutritional value. I now cook Doro mixed with vegetables that increase both its quantity and quality,’ says Zenebech. Currently, the project is working with Zenebech’s family and 39 other households in her village. These households grow vegetables to diversify household diets while the surplus is sold for income. Most of these farmers used to grow limited types of vegetables prior to this intervention. But ATONU introduced an additional nine varieties of vegetable seeds and trained the farmers in vegetable seedbed preparation, sowing and transplantation. Zenebech Abdu with her children (photo credit: ILRI\Apollo Habtamu). Zenebech has also learned how to cook baby porridge as a result of participating in the project. She now feeds her five-year-old baby based on guidelines she learned from the project, which has made her child healthier. She also now gives her children milk and other milk-based products which she says has resulted in improvements in her children’s physical and cognitive skills. According to Zenebech, being part of the ATONU initiative has led to tangible nutritional benefits for her and her family. Her family no longer frequently visits health centres now like they used to in the past and her children are scoring better results at school. 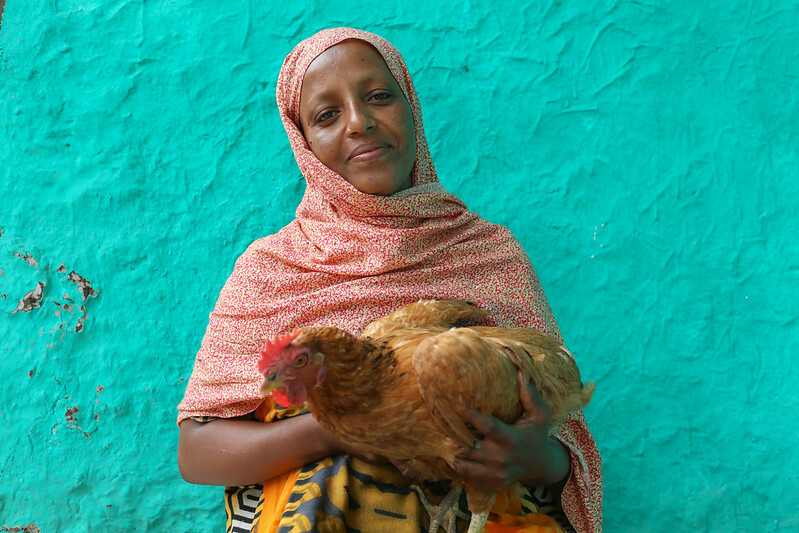 ‘ACGG/ATONU has given me 25 chicken, which has helped me and my family to eat eggs and chicken meat regularly. This has helped us to fight malnutrition,’ says Zenebech. This initiative has also helped raise the profile of breastfeeding in the village. Many women there have started exclusively breastfeeding their children for the first six months from birth and providing supplementary feeding after the six months, based on what they have learned during the weekly sessions. Zenebech and her neighbours have also improved personal and household hygiene and sanitation. She is particularly fond of the tippy taps that ACGG-ATONU introduced in Arabo 21 village. Zenebech is one of the 10 champions who have been selected from the village by the ATONU team. The champions will play an important role in making others aware of ACGG-ATONU interventions during village meetings and activities. Her participation is helping the project scale up successful interventions to the wider community to ensure their sustainability. Tags: ATONU, Diet, nutrition, women. Bookmark the permalink.